The Ionian archipelago sprawls down the west and south coast of Greece, comprising Kerkyra, Paxi, Lefkada, Ithaki, Kefalonia, Zakynthos and Kythira. As soon as you step off the ferry, you’ll be immersed in their rich history, which is evident in the numerous landmarks and architecture. 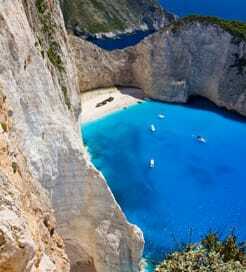 Kerkyra, commonly known as ‘Corfu’, is the most visited and popular of the islands. One of the highlights is the Palace of St Michael and St George. Previously the residence of British High Commissioners, it’s now home to the world-renowned Museum of Asian Art. A tour around this gallery will show you over 10,000 priceless Asian artefacts. Also on Corfu is the impressive Palaoi Frourio fortress, built in the 15th Century. It was used to successfully repelled all three major Ottoman Empire sieges in 1537, 1571 and 1716 and makes for a fascinating day out. On Zakynthos, be sure to visit the Roma Family mansion in Zante Town. It was built in 1660 and was one of the few buildings to be left standing after the 1953 earthquake. It hosts stylish period furnishings and large, beautifully decorated rooms, giving you a real insight into its history. Delve further into the islands’ past with a visit to the Venetian style castle, Kastro, on Kythira. It sits in front of an enormous cliff, offering breath taking coastal views. There are many Ionian sites and landmarks referenced in Homer’s Iliad. One of the most popular is the Fountain of Arethousa on Ithaki, which is where Odysseus’ swineherd brought his pigs to drink. It’s well hidden amongst untouched landscape and the round trip takes around three hours, so bring plenty of water and something to eat. The Ionian Islands are well connected by ferry, with crossings from mainland Greece and the Italian east coast as well. The Greek departure points are in Kyllini, Ithaka and Kefalonia, with services running almost every day. If travelling from Italy, you can depart from Ancona. This route is operated by Anek Lines Superfast Ferries, who offers a leisurely half day journey to Corfu. You can also sail from Bari and Brindisi once and twice a week respectively. These journeys last about a day on high-speed, comfortable ferries. "A very pleasant crossing. Staff were friendly and helpful"
We enjoyed the journey with no problems. The staff were pleasant. The food was adequate but a little expensive. We were required to leave our cabin rather prematurely we thought and then had a long wait for disembarkation. The ferry was very big, plush and looked more like a cruise ship than ferry crossing. The staff were friendly and helpful. We enjoyed a meal in the self service buffet as we set sail. Our cabin was spacious and comfortable. I would recommend the Knossos Palace to fellow travellers and would use it myself again. We booked a twin cabin with sea view which was really spacious and comfortable. The whole ship was smart and clean and it never felt busy - no queues at the self-service and plenty of tables in the bars and restaurants. All in all a very enjoyable experience and we arrived in Greece feeling refreshed for our onward journey. 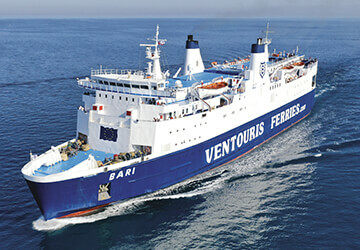 For more information, please visit our Ferries from Italy to Ionian Islands page. For more information, please visit our Ferries from Greece to Ionian Islands page. For more information, please visit our Ferries from Kefalonia to Ionian Islands page. For more information, please visit our Ferries from Albania to Ionian Islands page.